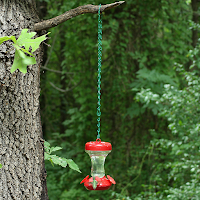 Home » squirrel proof bird feeder tips » How to hang a bird feeder to keep the squirrels away? 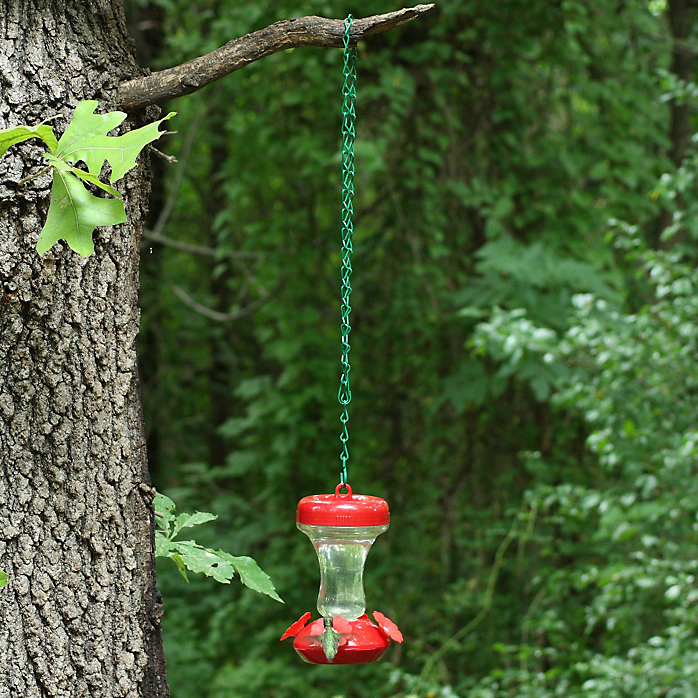 How to hang a bird feeder to keep the squirrels away? We don't want this, right? If you've already seen my squirrel proof bird feeding tips before finding this article, you have probably noticed that I've paid a great deal of attention to the issue of bird feeders placement there. People usually go wrong hoping to find the best squirrel proof bird feeder as one stop solution that will get them rid of the squirrels. But in fact, the feeder itself works with full anti-squirrel potential only if hanged correctly. 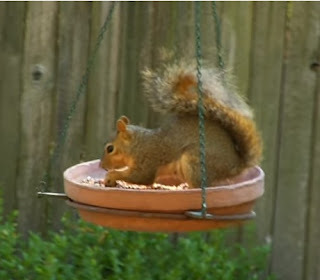 Therefore, proper bird feeder placement is the cornerstone of your squirrel proof strategy. Please remember that the anti-squirrel bird feeders should be regarded as the last line of defense against the squirrels and you should do everything possible to make it hard for the squirrels to come close to your feeder. Otherwise, even the best squirrel proof feeders tend to become more or less vulnerable to the squirrels if placed incorrectly. So what is the purpose of the anti-squirrel feeder? And what is the importance of hanging feeder the right way? The importance of good feeder placement is to prevent squirrels from scaring off your feeder visiting birds ad to minimize chances the squirrels attack or damage your bird feeder. This is truly important to understand and I'll be more than happy if you take this to your knowledge. Here I'll share some practical advice focused on where and how to to hang your bird feeder to prevent the squirrels from reaching it. Please take care to take each tip into serious consideration or otherwise the results may be below expectations. Did you know the squirrels don't live in Australia? But if you came here from any other part of the world make sure to remember that hanging bird feeder to the tree is the worst possible choice you can make. Trees are natural habitat for the squirrels. It's their home. How hard can it be then for the squirrel to reach the feeder hanging from a branch? Next to nothing. Trees are place for squirrel feeders, and not for bird feeders. No matter how aesthetically pleasing your feeder may look somewhere a the tree crown, hanging bird feeder to a tree is the same as feeding the squirrels, not he birds. Knowing that even the best and the most expensive squirrel proof feeders in the world could not cope with this situation with great success, it's time to give up this non-idea. Hanging your bird feeder near backyard fences, parked cars, trees, roofs or any other object from where the squirrels can (and will) jump from is also big no-no! It is important to find "clean" spot in your backyard so that the squirrels could not reach it by jumping all the way to it. But how near is "near"? The longer the distance, the better. It is really important to discourage the squirrels from taking this kind of long distance jumps because of the risk of damaging your feeder by falling it on the ground. But what if your backyard does not offer enough space? Then you should get the sturdiest bird feeder that shock the squirrels. Its metal construction is resistant to squirrel jump ons, while the electric shock is repellent-like feature that will make the squirrel leave in no time so that the birds can get back to the feeder shortly. Chains are weather resistant and do not tend to thin out like ropes do , so you don't risk your feeder to fall down from hanging hook. You can either use stainless steel chains or powder coated steel bird feeder chains that resemble wrought iron. Both are rust free. Chains are resistant to squirrels teeth and you can never tell what the squirrels are up to. Bird feeder poles with anti-squirrel baffles are absolutely necessary for proper bird feeder hanging. Still, there's a single trick to it. You can't use just any pole height. The rule of the thumb is that 8 foot bird feeder pole is the optimal in height because the squirrels can not reach it by jumping from the ground. Anything less than that may be the subject of ruthless squirrel invasion. Another important thing aside from height is that the pole must be equipped with anti-squirrel baffle. This is why I chose Kettle Moraine 8 foot pole to be presented here because it's the only pole in the market that meets all required demands. For more details about Kettle Moraine bird feeder pole please check my article about 8 foot bird feeder poles. Feeder domes are pretty much like anti-squirrel baffles. But unlike the baffles, the domes protect the feeders from the squirrels coming from the above the feeder. Domes feature slippery surface to make it hard for squirrels to sneak over it, and more importantly - the domes are designed to lose horizontal position when under the squirrel's weight, so that the squirrels fall to the ground easily over slippery surface. But that is not the only function of the domes. 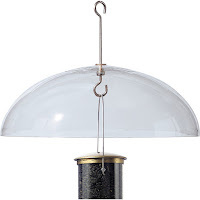 Domes are pretty much the best way to hang the feeder to a pole and are compatible with the most of the hanging feeders. Another great thing about having the dome is that it also acts as a weather guard for both the birds on the perch and for the feeder's seed ports. When it comes to the feeder domes the general rule is that the ones with bigger diameter are more effective, That's why I chose Aspect's 18" anti-squirrel dome to be presented here.